So what exactly is Plein Air Painting? I joined a group of Plein Air painters last spring. I am pretty happy with my latest attempt. What exactly is Plein Air? Well according to Wikipedia: En plein air is a French expression which means “in the open air” and is particularly used to describe the act of painting outdoors, which is also called peinture sur le motif (“painting of the object(s) or what the eye actually sees”) in French. To me that definition is correct but a bit bland. My definition from my experience would also have to include this list: Camaraderie with friends, challenging your mosquito or gnat threshold, battling mother nature, sun, rain, wind, too hot, too cold, constant changing of light and shadows, having aha moments, juggling all your gear, and the pure joy of painting in nature. This year I am making some progress. I am getting a little faster. I am understanding the medium of working with oils a little more. I was more familiar with Acrylics, and oils had a learning curve for sure. I find it interesting how you can have a plan of how to paint a scene, but once you get started sometimes it turns out totally different. Sometimes a happy accident and it works. Sometimes – not so much. Every painting is a chance to learn something new and to build on your skills. 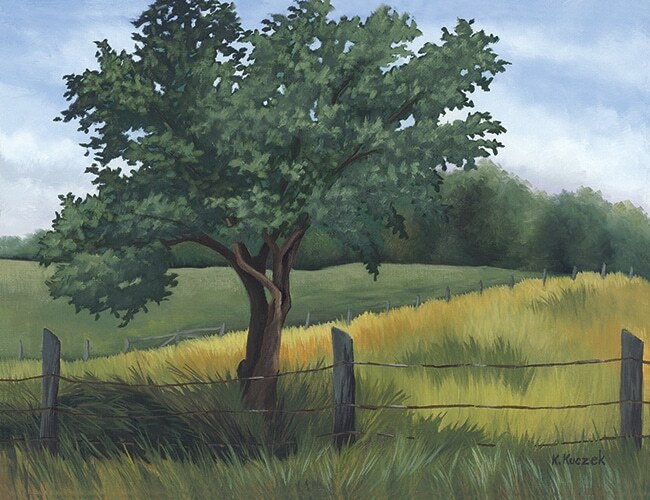 There are Plein Air groups all over the country. Grab your paints and tag along – you will be hooked before you know it.